Over the weekend six of us got together to brush up on WFB 8th edition a bit more. Half of us had played a few games, the other half had either one or no games of 8th under their belt. We played 3 games at 1500 points. I had a second Thanksgiving dinner (this was Sarturday) to go to, so had to bail out on the third round. I won my first game against Dogs of War (using that fan made PDF DoW armybook that's floating around the internets,) though it started off very rough. I took a lot of casualties from missile fire and lost my general and his depleted unit once they got into combat. The WLC was chased away almost immediately by a small unit of light cavalry, and both weapon teams were sniped. This is a photo late in the game. The Abomination is stuck between a militia spear unit (background) and a pike unit (right.) Fortunately, due to the free-wheeling reform rules of 8th edtion, my unit of clanrats on the hill had fought a round of combat, won, chased off the spearmen in the far background, then fought a combat in the DoW turn, won, reformed, then charged the pike unit from behind then following turn. The Abomination, meanwhile, ran over to and ate half the spearmen in one round while suffering no wounds himself. From the jaws of defeat, I pulled victory. My second game was against one of the other first round victors, Daemons of Chaos. This is a fairly early game shot. There's a unit of Bloodcrushers off in the far distance chasing my gutter runners. In the foreground is where my Abomination used to be, but the unit of Flamers made quick work of him (shooting.) So there are two infantry units (horrors & bloodletters) slowly advancing, while two units of hounds target my WLC and mortar team. This is a little later. After the WLC was destroyed, my rat ogres turned in on the hounds and killed all but one. The horrors then flanked the rat ogres who rolled terrible, didn't cause a single wound but at least rolled snake eyes for their break test. 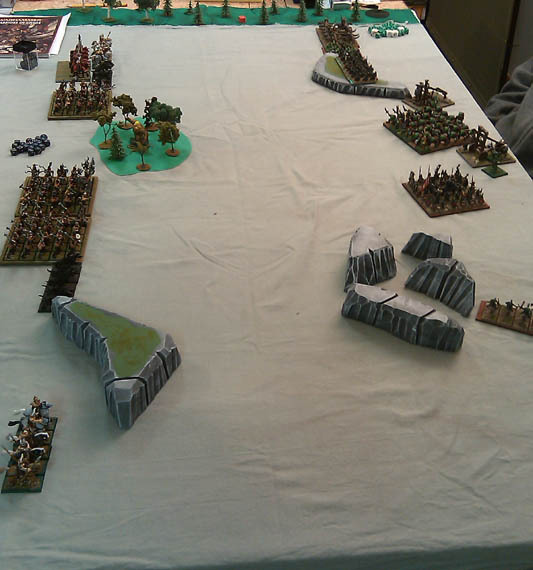 The next turn the one remaining ogre ran and both units pursued, into the woods along the edge of the table. The other set of hounds reformed after eating the mortar team and hit my clanrats (with the Warlord) in the flank. They were easily destroyed and the next turn both units of clanrats charged the bloodletters and annihilated them in a single turn. 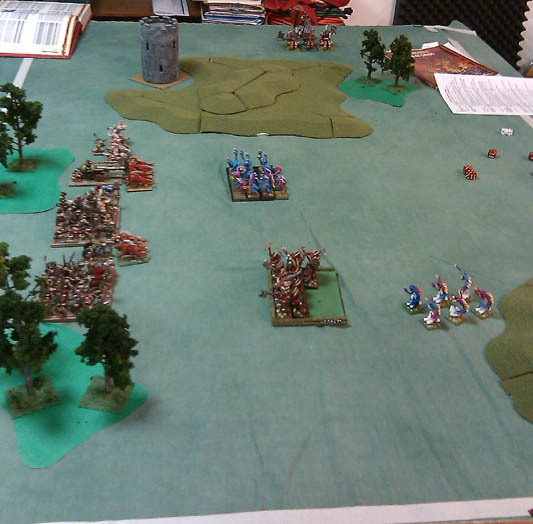 So with that, the table was a mess, but we both had about half our armies in pretty good shape. My opponent had 2 bloodcrushers and a hero, plus about 12 horrors and 6 flamers. I had two full units of clanrats, my Warlord, BSB and a fire thrower. This is a shot of the start of one of the other second round games. Marauder heavy Warriors of Chaos on the left, Orcs & Goblins to the right. I don't know who won. The other army not shown in any of the photos was an Empire army.